Teenage Engineering has launched a special edition of its K.O! 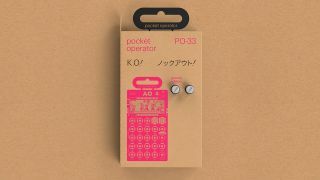 Pocket Operator in collaboration with Ghostly International. The Ghostly K.O! sampler commemorates 20 years of the New York-based music/art label and features an exclusive sound and pattern set from Ghostly artist Steve Hauschildt. It appears that the PO-33 K.O! Ghostly edition is a limited run, but we're not entirely sure on the exact numbers available. You can get hold of one from either the Teenage Engineering, or Ghostly web stores, priced at $135/£129.